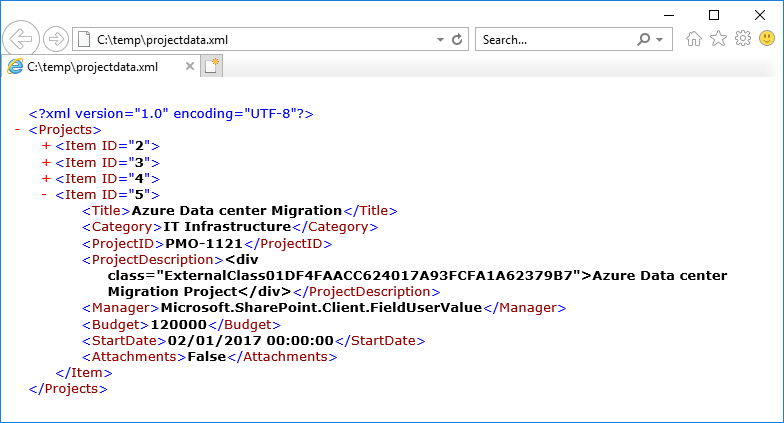 Requirement: Export SharePoint Online List data to XML file. Write-Host -f Green "List Items Exported to XML!" This PowerShell script extracts data from all columns and exports to XML. You may have to handle columns like People Picker, Lookup, etc separately. Use REST API Call to Get SharePoint List Data into XML format: https://Your-Domain.sharepoint.com/_api/lists/getbytitle('List-Name')/items? , E.g. https://crescenttech.sharepoint.com/_api/lists/getbytitle('Projects')/items?